Kampung Phluk. 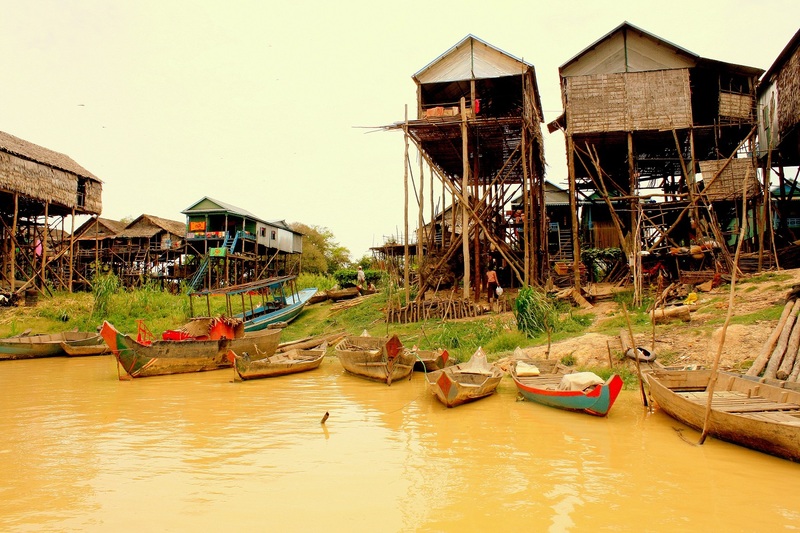 Known for its elongated, stilted houses by the side of a lake providing it a rustic charm that is Cambodia’s fishing empire. 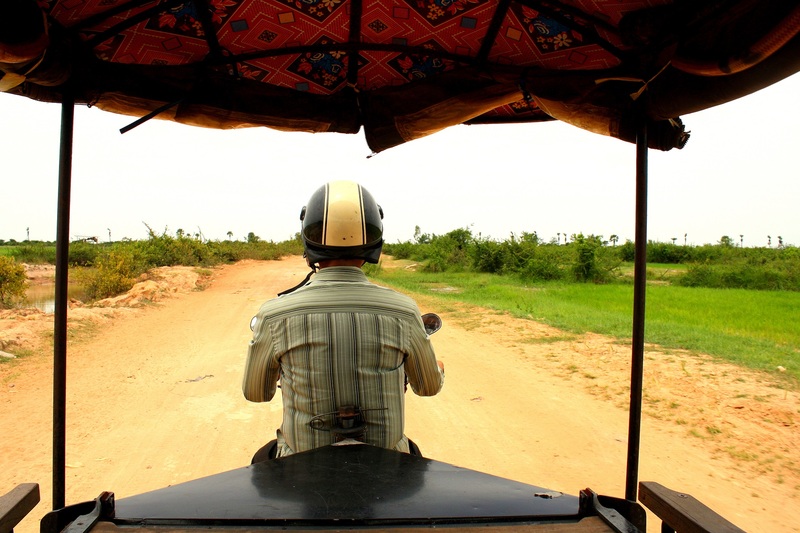 I tuk-tuk-tuk tuk to Phluk from Siem Reap in an erroneous, one and half hour hither and thither movement. A Sedan would get me there in 40 minutes. But Vanna is on standby 24/7 in front of My Home Cambodia. Short, dusky and wearing dishevelled tees and trousers, the curly-haired Vanna always propels his two front teeth whether or not he is smiling. His thin and long face is disproportionate to his height. His tuk-tuk slightly swerves left and right while moving fast. It jerks and bumps. However, the velvet-brown cushioned seat with embroidered frills gives me a royal feel. “More, more go.”Vanna utters his elementary repertoire of English words. “Yes, Siem Reap. Kampung Phluk, Siem Reap”. No sunglasses. I want to see the red earth and the chocolate ponds as they are. Finally Vanna’s tuk-tuk makes a panting tuk…tukk…tukkk! 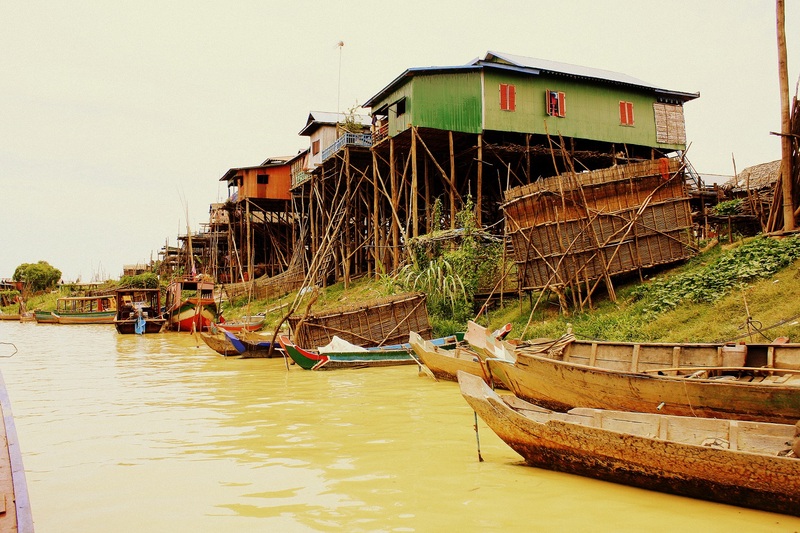 We book a boat to Tonle Sap at an office. US$ 30. Dollars are widely accepted in Cambodia. “You go, this man. I wait here.” Vanna leaves me with a Khmer-only speaking boatman. The boatman smiles at me. Thrusting the oar hard into the earth he reverses his boat. Away from the jetty, the canal widens and the boatman starts the engine. 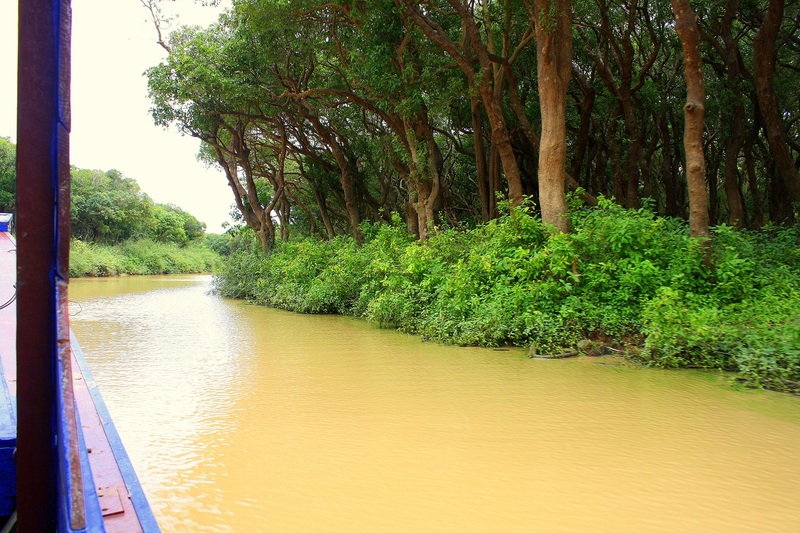 We cruise along mangroves which herald the greenery. Green woods and the chocolate canal! A spin of silence! Anyone really here? Trrrrrrr… another boat. Two men on board wave hands to me. Then a curiously netted boat with wooden logs on the deck meanders past us. A smaller, faster one winds its way between us and the netted one, leaving chocolate ripples. I watch the stern of the netted boat vanish into the lush vegetation. 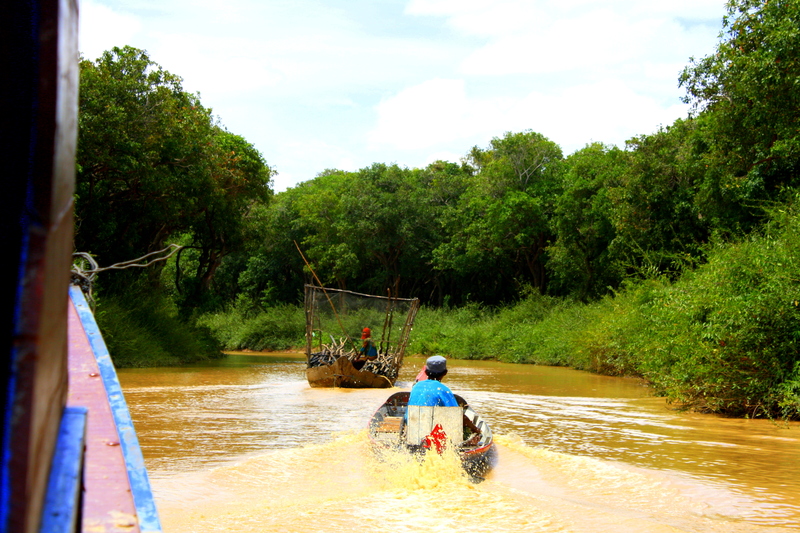 “Ya, ya”, the boatman smiles and continues in Khmer. I nod. The boat takes a sharp turn to the right. The canal narrows down again and there could be a jetty? Yes! We see more boats and spot the first of an array of stilted houses. Huge ones, tall and straight, most of them, 8-10 metres in height and 3-5 metres wide. Long ladders lead up to every house. Boats of different kinds and sizes float in front of the houses. The houses are painted red, green, blue; some show thatched facades. The walls are made of different materials – thatch, asbestos or wood. Some have more than two windows and some, none, but with an open entrance. Some have ‘luxurious’ balconies with colourful railings. At one bend, there’s a ladder connecting two houses. Foul smells. The boatman points towards pig pens and chicken coops underneath the stilts. There’s more to animal farming than just fish. 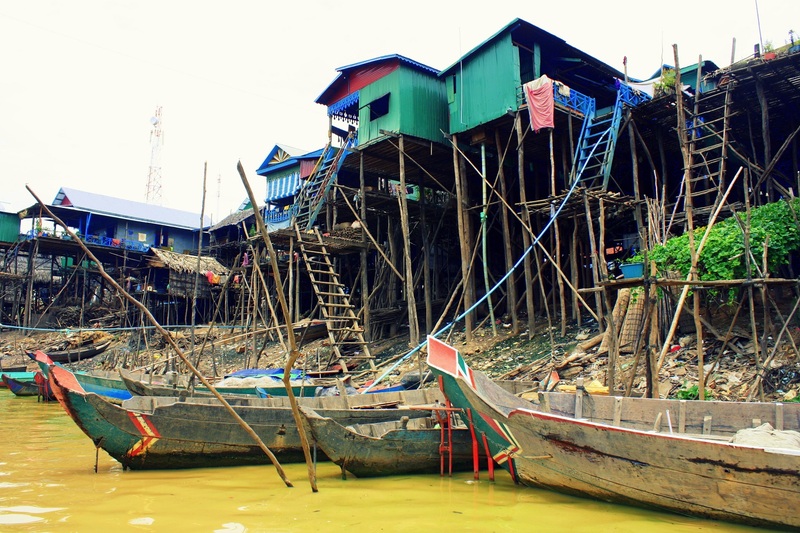 Fishing nets are everywhere: among the stilts, hung by the side of the houses, and spread on the banks of the canal. During monsoon you couldn’t see the bottom of the stilts. People move upstairs for months together. 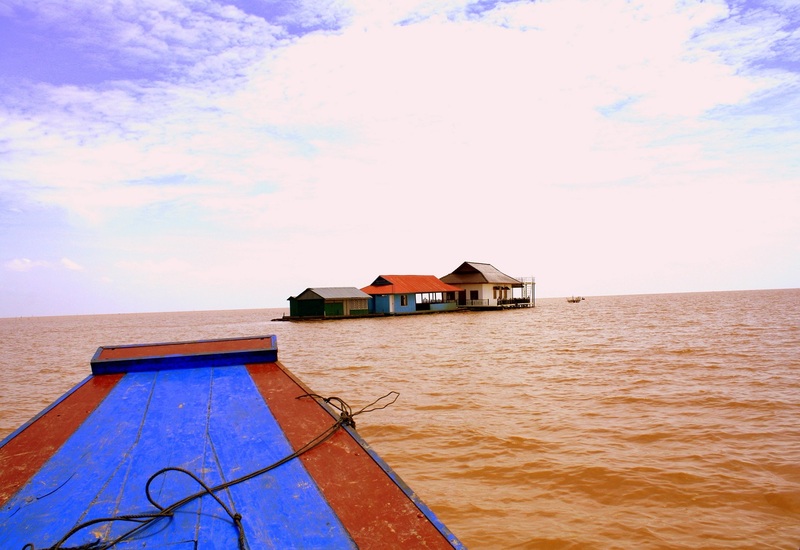 That is when Tonle Sap rises in majesty. It is July and only the beginning of the season. I could see the houses top to toe. Children’s playful voices. Three boys and two girls, looking 3-4 years old, half naked, engaged in childish revelry, splashing water. They smile and wave to us. 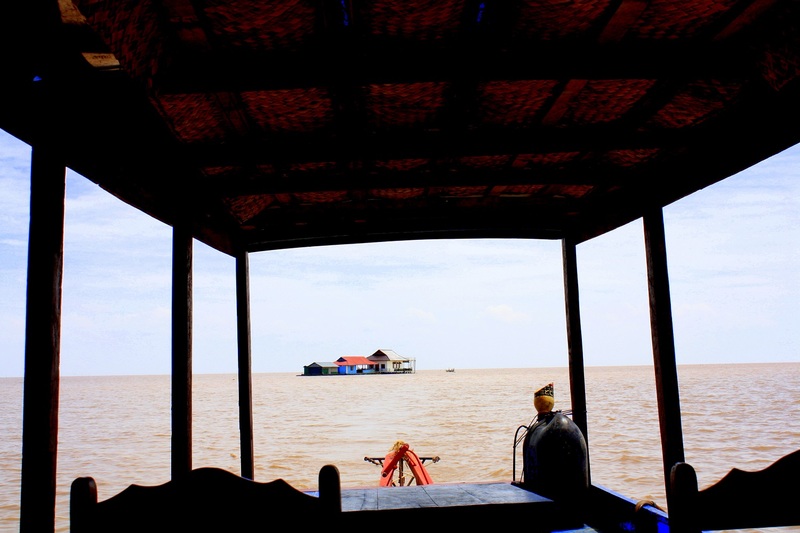 We slowly enter the vast and endless Tonle Sap. An imposing spread that rivals the sea in its appearance. Its sheer length conceals its other end; stretching to 2,700 km and up to 16,000 km during monsoon! Here’s a floating restaurant. Its stilts are under water. We venture along the lake. It is chocolate all over; but something floating in the middle. A beautiful house. My boatman’s Khmer explanation probably means a guest house. He forms five and zero with his fingers and utters “Dollaaa(r), dollaaa(r)”. The boat gyrates the house and heads back to the restaurant. “How are you?” A young lady there greets me. Dressed in jeans and a purple-coloured t-shirt she hands me the menu. The menu offers amok, fried rice and pancakes. Amok and rice. 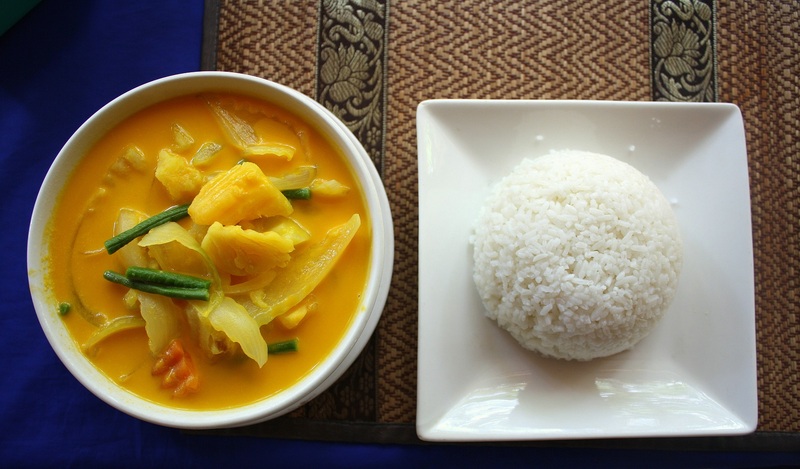 Amok is a bright yellow Cambodian-style chicken curry with plenty of gravy mixed with carrots, potatoes, beans, and onions. 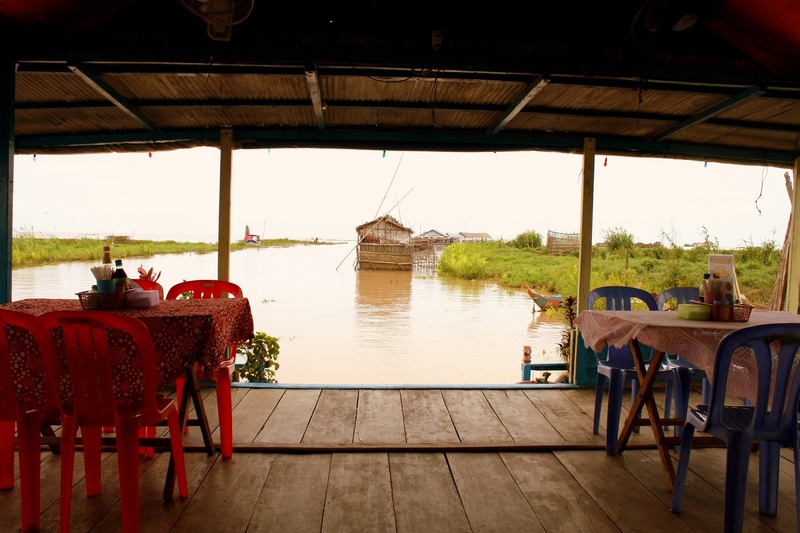 Watching Tonle Sap, I savour my first Cambodian lunch. The boatman smiles again; time to sail back. We get back to the jetty faster than expected. The boatman looks at me for a goodbye smile. Sorry, I haven’t learnt ‘awkunh’ (thank you) yet. I feel guilty waking up a slumbering Vanna, but he quickly gets dutiful. Tuk-tuk-tuk-tuk-tuk back to Siem Reap! Sunglasses on. Arrange a car or tuk-tuk from your accommodation in Siem Reap for USD 20 per person if you are travelling in a group of 3 or 4. The more the number of people, the lesser the price. A car ride will take you to the boat jetty in 40-45 minutes whereas the tuk-tuk may cover the journey in 1 hour, 30 minutes roughly. Please double-check with the hotel for any change of prices.